Note yet again at the same time there are two shocking events heading the news: three murdered in Belgium; journalist murdered in Ukraine. The former blamed on Muslims the latter blamed on Putin whilst the Gaza bombing goes completely unreported. Now how convenient is that? BBC I think you give the game away. But now (surprise! surprise!) it turns out that journalist Arkady Babchenko reported shot dead by all western media, and conveniently blamed on Putin and Russia, has reappeared alive and well and wasn't shot at all! Ukrainian Security Service says it staged the Russian journalist's death to catch those who were trying to kill him. "The Chief of the Security Service of Ukraine (SBU), Vasyl Hrytsak, said Russian special services had recruited a Ukranian citizen to organize the murder of Babchenko, who in turn had arranged for an acquaintance to carry out the task. "We state that the questions of life and death in Ukraine, as well as the international community's confidence in Ukraine's policy, are nothing more than bargaining chips for the anti-Russian hysteria of the Kiev regime," the statement said." "News of the apparent murder had stunned Kiev on Tuesday. Shortly after Babchenko's death was announced, Moscow and Kiev began blaming each other for the killing of the journalist, who is a vocal critic of the Kremlin and left Russia in 2017, saying he no longer felt safe. Babchenko called Russia an aggressor, and accused the country of killing children in its air support of Syrian President Bashar al-Assad's regime." So what could have happened there then. For those of us who are mocked and condemned for suggesting that many so called 'terrorist events' often contain elements that are false and blamed on innocent parties, now have a case that has actually been admitted as a confidence trick. Presumably the purpose was to heap blame on Putin and to distract from further Israeli aggression in Gaza, but now it is presented as just an operation to save his life and flush out the true killers. Or was it a true bluff to demonstrate how easily fooled western media can be? 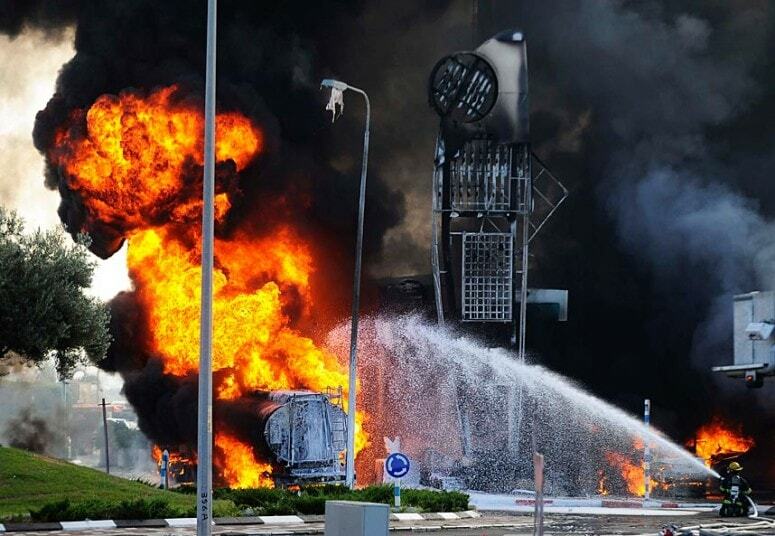 It is said this petrol tanker was set alight by a mortar in the southern Israeli town of Ashdod. Believable or not? Meanwhile back in Israel, today's largely unreported offensive is conveniently blamed on mortar attacks from Gaza, Any state that shoots dead hundreds of unarmed civilians cannot be trusted with ANYTHING. Israel has become a rogue terrorist state that is deeply implicated in terrorism abroad and at home. It is quite prepared to fabricate events both to distract from its actions and to justify them. So I agree, where is the evidence for these 'mortar' attacks, where is the damage and where is the proof if they were fired, that assets of Israel did not fire them? Ahhh real terror in this image. A ball of fire is seen following an early morning Israeli air strike in Rafah in the southern Gaza Strip. Gaza health officials have said that the overnight strikes have killed a total of 8 people, raising the death toll to at least 98.Picture: GettyNow here we are. And just as I thought. The Roseanne Barr story, also perfectly time to distract the American audience just as Israel initiates another attack, subsequently puts out some rubbish about wanting to be Israeli Prime Minister! https://people.com/tv/roseanne-barr-wants-run-prime-minister-israel/"Roseanne Barr‘s political aspirations aren’t just limited to the United States. While speaking at the Jerusalem Post‘s conference on Sunday, the actress, who is Jewish, revealed that she wants to move for Israel — and potentially run for prime minister. These spooky connections KEEP happening, but of course it's all and always "just coincidence". Goes without saying doesn't. How much more evidence of the zionist web linking money, entertainment, news and terrorism do people need? It is very clear that most media sources fail to report the true imbalance in force being applied and rather prefer the disingenuous narrative that this is a battle between equals. Nothing could be further from the truth as this image powerfully demonstrates. Israel is a brutal and lying state prepared to fabricate any situation to carry out its indiscriminate killing of civilians. It is a bully state of the very worst sort that western leaders are prepared to back with kind words, visits and arms deals. The West has lost all claim to a moral conscience and it is utterly sickening. "HISTORICAL IGNORANCE ALLOWS HASBARA TO THRIVE“He who controls the past controls the present; he who controls the present controls the future.” G. Orwell famously wrote in his story 1984. It is of course true. And ignorance of the past, fostered for this very reason, allows “Israel’s” propaganda, it calls ‘hasbara‘ to thrive and take root in the minds of the ignorant. One of the arguments that its hasbarists make in order to assert their mythical ‘claim’ on Palestine, is that “Palestinians are neither Canaanites nor Phoenicians. These don’t exist anymore and ‘Palestinians’ (in scare/insult quotes) are merely ‘Arabs’ and therefore migrants from Arabia who came to the area for economic reasons only after European Jews arrived and made the desert bloom.” Of course maps and old photographs and history itself show that this is patently false and base propaganda designed to deny peoplehood to Palestinians and take advantage of myths the Jews wrote for themselves. So the information conveyed here will dispel the silly myths and propaganda that Jews use to bamboozle the ignorant whilst they are busy stealing ancient Palestine." If Americans Knew added a new video: "Gaza the Broken Hearted" by Chris Hedges. Journalist Chris Hedges speaks factually and powerfully about Israel's assault on Gaza, and of the moral obligation to end all genocides. 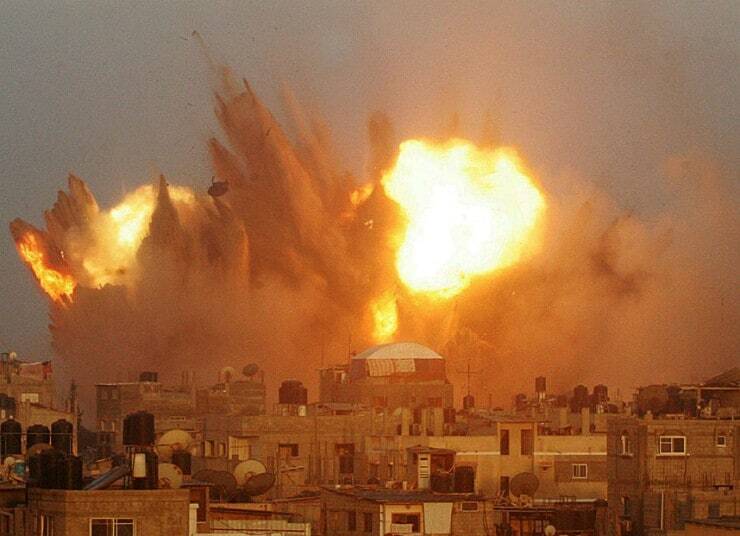 "The incursion and bombardment of Gaza is not about destroying Hamas. It is not about stopping rocket fire into Israel. It is not about achieving peace. The Israeli decision to reign death and destruction on Gaza, to use lethal weapons of the modern battlefield on a largely defenseless civilian population is the final phase in the decades long campaign to ethnically cleanse Palestinians…"
ALL our politicians should be made to listen to this! The people of Britain (and the world) need to realise, that Gaza is merely the testing ground for Zionist hegemony; the proof of Jewish callousness; the earnest of what we can all expect if tyrants are not stopped. Mark Roberts shared a link to the group: Stand With Palestine. Canaan was referred to in an ancient Sumerian record dating back to 3000 BC. Gaza is one of the oldest cities in the world, established by Canaanites in 3000 BC. “[Being of] Canaanite origin, Palestinians have priority; their descendants have continued to live there, which gives them continuity." -- late Prof. Ilene Beatty, highly renowned historian/anthropologist and specialist on the “Holy Land” in Arab and Jew in the Land of Canaan, 1957. The Hebrews were wandering nomads who didn’t enter Canaan until c. 1200 BC. They had 3 kingdoms. • 2nd Kingdom lasted from 1009 BC to 722 BC (Conquered by Assyrians) (287 years) 10 tribes disappeared at this point. • 3rd Kingdom lasted from 933 BC to 586 BC (lost to Mesopotamians) (347 years). The northern, 10-tribal alliance, known as the 2nd kingdom of Israel, lasted until 722 BC when it was politically obliterated by Assyrians, never to be resurrected. The southern (3rd) kingdom of Judea nominally lasted from 933 BC to 586 BC (lost to Mesopotamians) (347 years). The descendants of Judeans lived as a tiny minority in Palestine, they even dropped Hebrew in 200 BC for local and more widely known Aramaic, and began migrating en masse to Greece, later to Rome -of their own free will. The European Ashkenazi’s claim of “a land without people for a people without land” was always fraudulent.